This is my story about my wonderful son Sean William Howell. Sean has an overlapping case of this syndrome and his deletion is a little different from the Mowat Wilson deletion. Sean’s deletion is on Chrom2q21.2-22. This is the closest I have ever been to finding a syndrome that matches his symptoms. 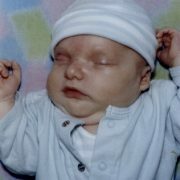 Sean was born on 11/7/2001. My pregnancy with him was different from my other two and it seemed as if every test came back with a problem. 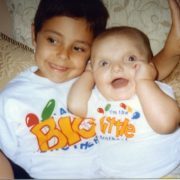 I was 33 years old at the time and we were shocked when my afp test came back positive for possible Down syndrome. 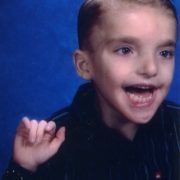 After an amnio and two weeks of agonizing we got the news that our child did not have downs. At that time I was not aware that there were so many other syndromes that could be possible that the amnio did not detect. We were relieved and were grateful our child would be healthy. This unfortunately was not the case. 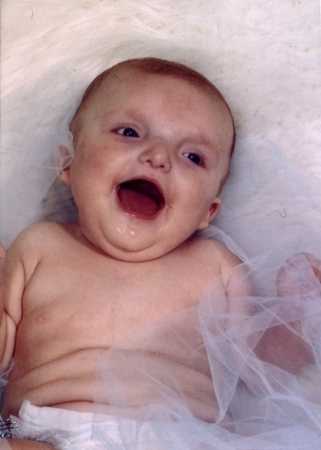 Sean was born, after 17 hours of him being in distress and us being told a c-section would be performed that never was done, and appeared to be typical in appearance. His Apgar score was a 9. 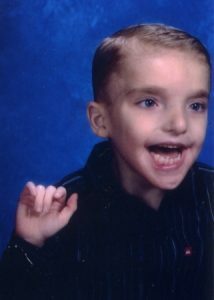 Looking back I feel that the negligence of my delivery caused Sean’s brain bleed and cerebral palsy but because of his genetic disorder we could not prove this. At first, they thought Sean had fluid on his lungs and put him on oxygen. Later it became apparent that this was not the case. A day later a cardiologist arrived and gave us the bad news. 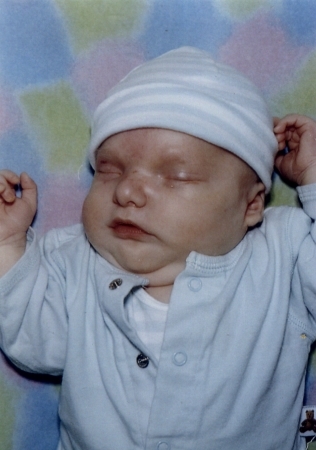 Sean was born with pulmonary stenosis, pda and asd. 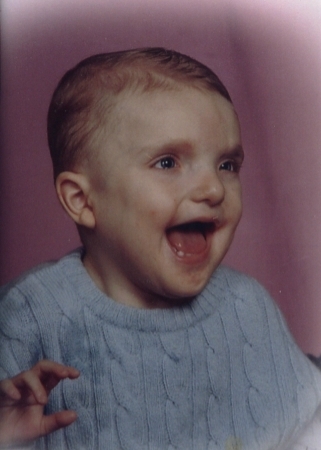 When Sean was transferred to a more advanced hospital they also told us that they wanted to run genetic tests because of the heart, possible hypospadias-which he did not have, and the extra skin around his neck and forehead. They also sent the geneticists to examine our child the next day. 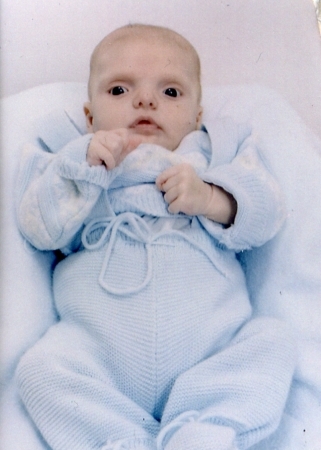 The geneticist spent about 5 minutes examining him and told us he had Noonan’s syndrome. They said the tests would most probably come back negative as Noonan’s syndrome had no test for it and is only diagnosed with a physical examination. For one week we thought he had this syndrome. During this week Sean had to have ER surgery for malrotation of the intestines and a cardiac catheter procedure. The same day of his cardiac cath, which he was transferred to UCSF, we received the news of the error in diagnosis Sean did not have Noonan’s but had a rare and unknown microdeletion in chrom 2. At that time there were no exact cases as there are none to date. We were floored and no one could tell us what this meant. Over the next 6 months Sean had open heart surgery, a colostomy, and a reversal colostomy and Hirschsprungs repair. He has had 6 surgeries to date. Sean’s conditions in addition to the chrom disorder are: Hirschsprungs disease, cerebral palsy, severe epilepsy, mental and physical delays, a history of severe reflux, malrotation of the intestines with repair, congenital heart disease-which his pulmonary stenosis has moderate leakage in spite of surgery which went well, mild dysmorphic features, which I do not agree with, and a rare foot deformity that is not visible to be really apparent except by a specialist. 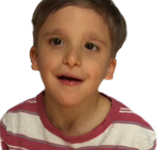 We had Sean evaluated by a neurologist at 6 months old and was told that this genetic disorder probably would not affect him and that his delays were due to his chronic illness and many surgeries. This was again said to us at his one year check up despite the fact that Sean could not sit or crawl. 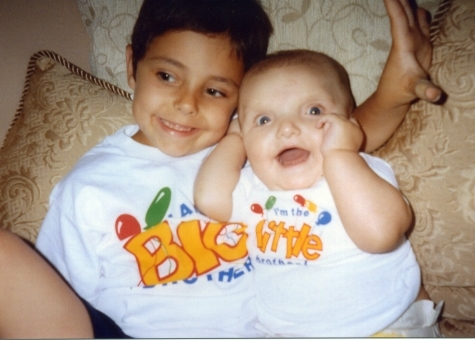 We were overjoyed and thought our child would be typical and we could move on and put this behind us. They were very wrong. Sean could not sit until he was almost 2 years old. Sean started commando crawling at 3 and a half. To date Sean can hop crawl and pull him self up to stand for a few seconds. We are not sure if he will be able to walk but we are not giving up hope. Sean wears braces and has had foot surgery to release his heel cords. Sean has always had good head and torso control and I feel this is why the neurologist may have thought things would have turned out differently. 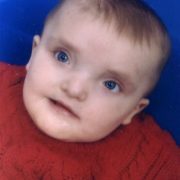 Sean will be five in a few weeks and attends a special Ed preschool 5 days a week 3 hours a day. Sean has OT and PT twice a month, they just cut us back 2 days a month saying Sean was not progressing fast enough. Sean has speech twice a week and we are looking into alternate therapies. 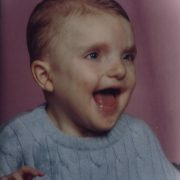 Sean does not speak but used to say mama and baba before his seizures began at 2 1/2 years of age. He now babbles and laughs but no words. We are having a very difficult time getting his seizures under control. 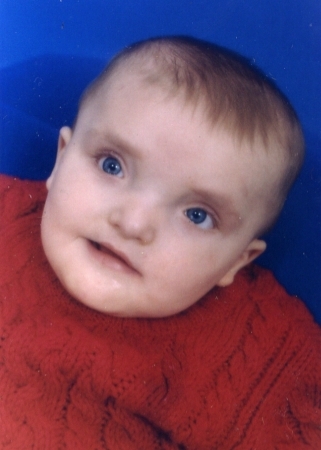 His seizures have lasted up to an hour and used to occur only when awakening from sleep. Recently, they are happening when awake and for short period of time up to 12 a day. We changed his meds to Depakote and Keppra but now his white blood cells have dropped and we are very worried and are going to see the doctor tomorrow and have new tests ran. The doctors do their best but personally I feel they don’t know what is going on. Sean has been sick for the last few days but has had no seizures for 17 days. We have now taken him off the Depakote and went back to an increase in the Keppra. I am very worried that his new meds had a bad reaction to him and the doctors will not be frank with me. I will only tolerate this one more day until I demand to know what is going on. My husband, Don, and I have always been aggressive and we are now more so than ever having to fight for everything for Sean. Recently we requested that a LVN be present with Sean at school to administer Diastat which the school personnel will not do. ( We do this at home). The school district is fighting us every step of the way and I intend to win. I will never give up and take it to the top. I think this is important for every child with special needs. Needless to say we are very unpopular with the school district and other programs. I found this website through a geneticist that sent me info on this syndrome telling me this was an overlap. I am very grateful for this information. Through this website I see that Sean is not alone with this rare disorder. 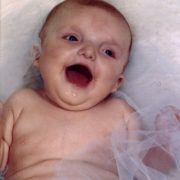 There is even a picture of a child, who now is a grown man, that looks so much like Sean that I almost fell over when I first saw it when browsing this site. I am so glad to have a place I can go and not feel so alone. 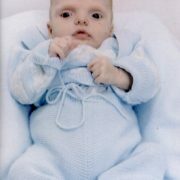 I recently had my fourth son, Sean is our 3rd, and we declined genetic testing. We were blessed with a healthy son who is almost one. Dylan has been walking since 10 months old and this to me is such a blessing that I took for granted before Sean. I only wish that I can see Sean take his first steps and say his first words. I wonder if he knows that his little brother can do these things and he cannot. He is well aware of him and often tugs on him and is very jealous. We keep a good watch on the both of them and are hoping Sean will get along with his brother more as he gets older as he does with his schoolmates. Sean is a very social boy but can have spells of headbutting, biting, and pulling hair. These are things that I went through with my other children as well. Sean is no more difficult to handle than my other children are.